What is a Growler Collar? Growler Collar™ is a five inch diameter disc that threads onto the top of amber and clear glass 64 oz and 32 oz cider and beer growlers, allowing beer and cider drinkers to turn their growlers ‘Bottoms Up!’ after rinsing them so air can eddy within the cider or beer growler as water drips out. It’s a growler dryer. A cider or beer growler is a 64 or 32 oz, clear or amber glass jug. The “green” way to take home draft beer, hard cider, mead, root beer or wine. The term ‘growler’ dates back to the late 19th century when fresh beer was carried from the local pub to one’s home by means of a small-galvanized pail. It is claimed the sound that the CO2 made when it escaped from the lid as the beer sloshed around sounded like a growl. 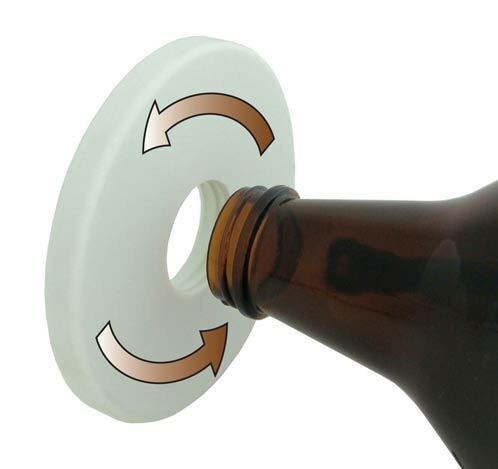 Attaching a Growler Collar™ to a cider or beer growler is simple. Just thread the Growler Collar™ on the top of a growler and turn it ‘Bottoms Up!’ It’s the safe and fast way to clean, drain and dry your cider or beer growler with no fuss or hassle. Rinse Growler with very hot water, twice. Attach Growler Collar™ – feet up. Invert Growler and place on counter to drain and dry. When growler dries (appx. 12-24 hrs. +/- depending on humidty) remove Growler Collar™. Replace cap. Your growler is now ready to refill. Please Note: Do not place Growler Collars™ on hot surfaces or stoves, whether attached to a growler or not. Plastic composites are flammable. Custom Printed Growler Collars™ are a great way to promote your craft brewery, taproom, Growler filling station, or related business. Get your logo, image or branding on the top of a Growler Collar™. Use the template below for designing your custom Growler Collar™. Download the PDF. Have your designer add your logo or graphic. Then submit it to us. 24 stock colors are available… see color palette below. Minimum wholesale order is 100 units. There is a $55, one-time Cliche’ (plate) fee for single color printing. 2nd color is $45 to imprint/100 units + $55 Cliche’. Cliche’s are reusable. FREE quotes on request. PMS Colors are available for an additional fee. Please contact us for inquiries. Check out all the custom Growler Collar™ graphics we’ve done for businesses and organizations. These are several of the Growler Collars we’ve made that are currently in circulation. A Growler Collar™ with your company’s logo is the perfect accessory to a custom growler. Additionally, you can purchase Growler Collars™ in our own “Hops Wreath”, “Hard Cider”, and “Brewed in America” designs. To view the custom Growler Collars™, just click on the thumbnails, the image will open in a larger overlay. 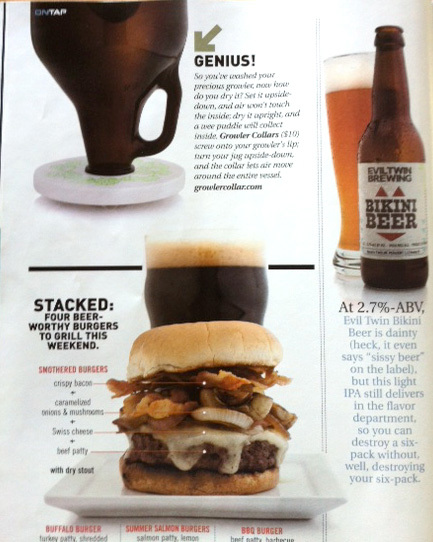 People are excited about the Growler Collar™. 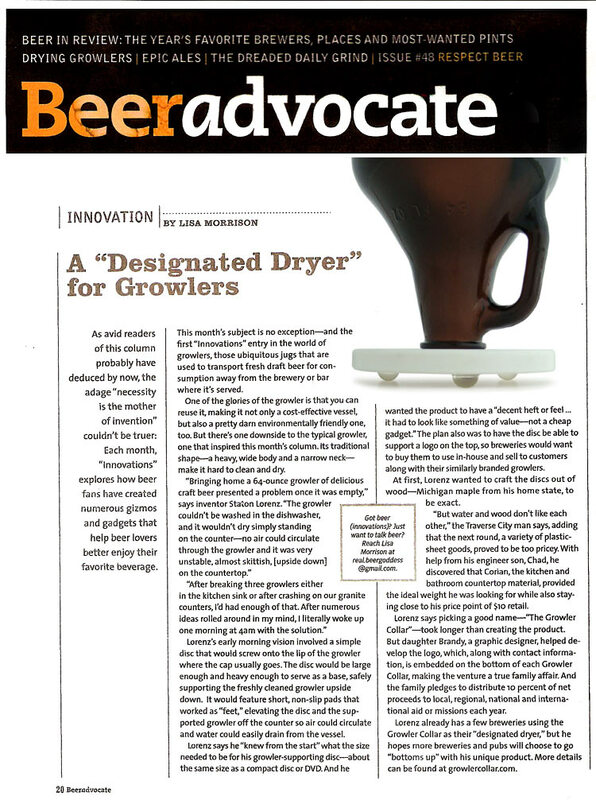 We’ve been featured in several publications recently including Lisa Morrison’s ‘Innovations’ column for Beer Advocate magazine. 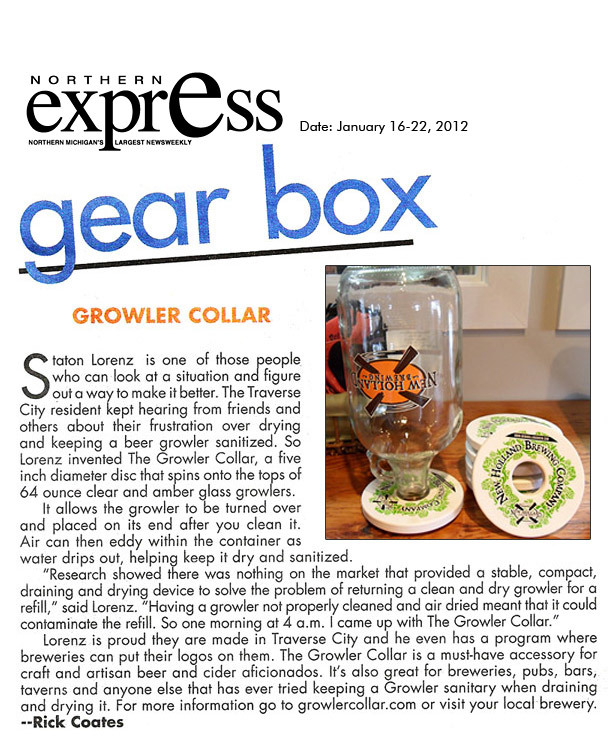 Here are a few more articles about the Growler Collar™. Please take a moment to visit some of our online friends and partners. 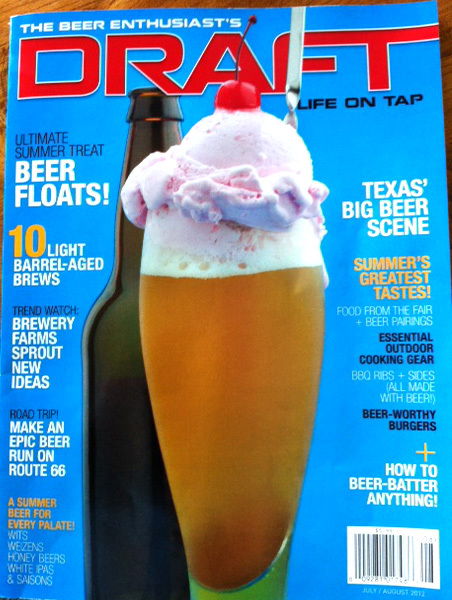 We’ve also included links artisan and craft beer info. Growler Collar™ Creator Staton Lorenz wrote this review of the 3rd Annual Traverse City Microbrew & Music Festival. If you’d like to contact us please use the information below. We’d love to hear from you. Necessity is the mother of invention and the Growler Collar™ is no exception. Bringing home a 64 oz. growler of delicious craft beer presented a problem once it was empty, the growler couldn’t be washed in the dishwasher and it wouldn’t dry simply standing on the counter. Also, no air could circulate through the growler and it was VERY unstable, almost skittish, on the counter top. Research showed there was nothing on the market that provided a stable, compact, draining and drying device to solve the problem of returning a clean and dry growler for a refill. No craft brewery wants their favorite suds to blend with bacteria and other funk that thrives in a moist, warm cider or beer growler for a few days between fill-ups. So… one morning at 4am the idea came to me – a gift from God, a simple disc, elevated on three non-slip feet. The desire to make Growler Collar™ in the USA led to the current composite that’s injection-molded here in Michigan. I’m proud to say “Growler Collar™ is made in the USA… just like your favorite craft brew, hard cider, mead or wine… Bottoms Up! Growler Collar pledges to distribute up to 10% of net proceeds to local, regional, national and international aid and/or missions each year. Thank you for your support.